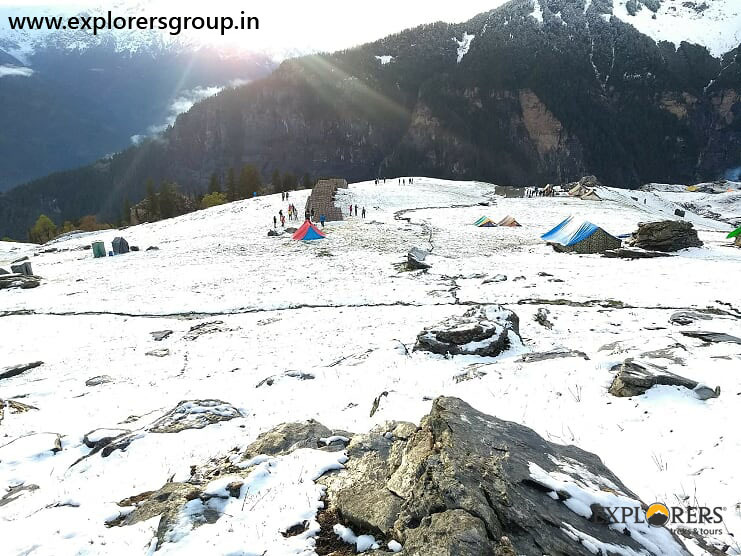 Manali Snow Trek will offer you the best views of Himalayas. Manali looks stunning in winters – the white beauty! It is all covered in snow and it looks magical, just like some wonderland right out of a fairytale. 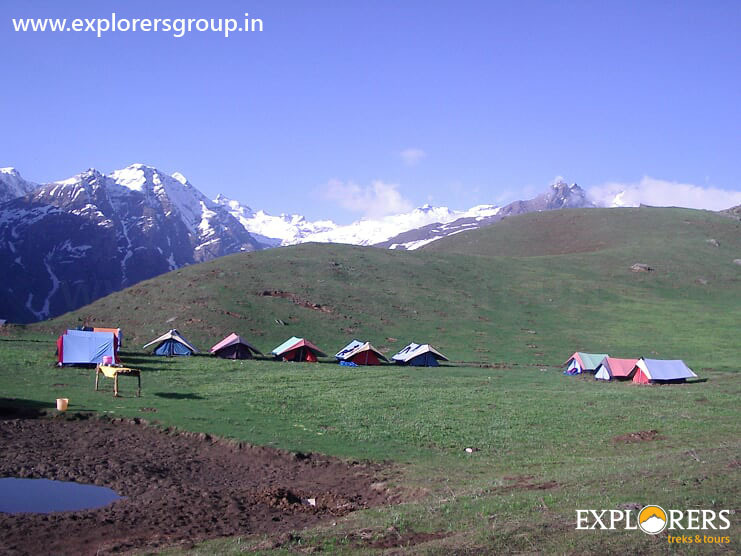 Manali is nestled between two Himalayan ranges – Pir Panjal and Dhauladhar. Manali with lush green forests and crystal clear gushing Beas River with the backdrop of White Mountain peaks is all an adventurer seeks! 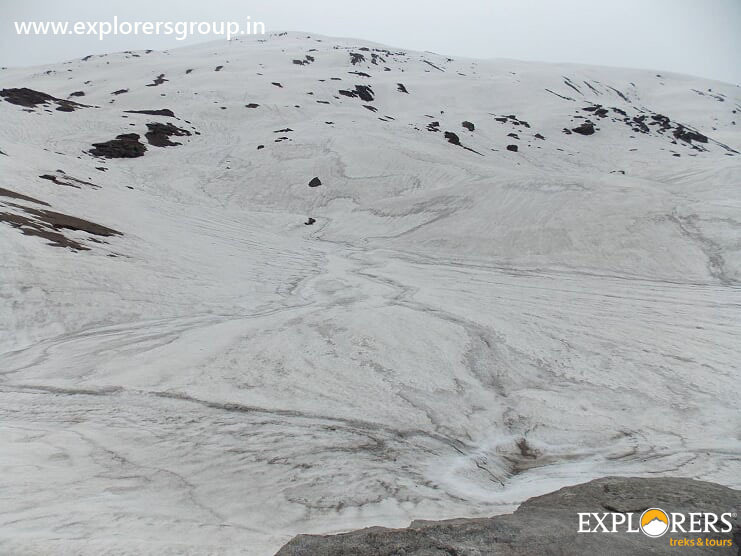 Manali Snow Trek will start from base camp Shuru and Prini, which lies to the north of Rohtang Pass. It’s the most lively and charming village in the valley. Most of the treks start from here. Naggar was once the capital of Kullu valley. 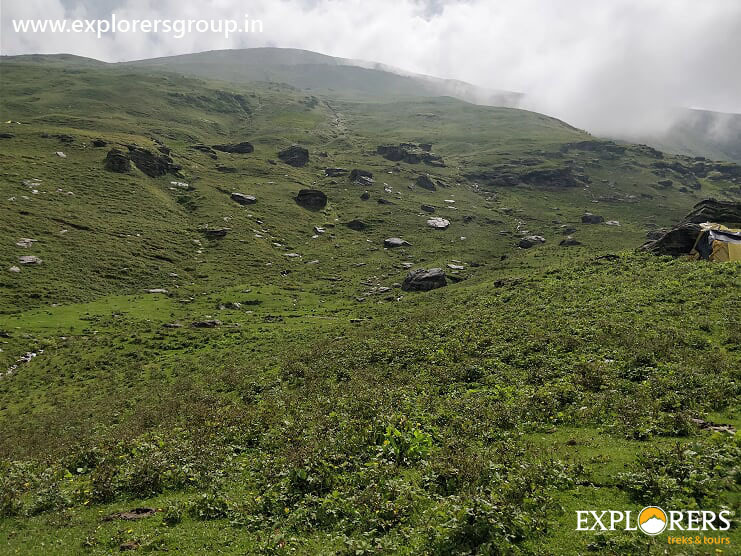 You will start trek to Hamta Hills, Hamta Village and Setan Village where you can get the views of Dhauladhar ranges – Hanuman Tibba, Barabhangal and distant Kaliyani Pass. The villages are inhabited by locals of Kullu Valley and are untouched by tourists. You will visit the verdant Sterling forest that has Cedar, Magnolia, Oak and Pine trees. 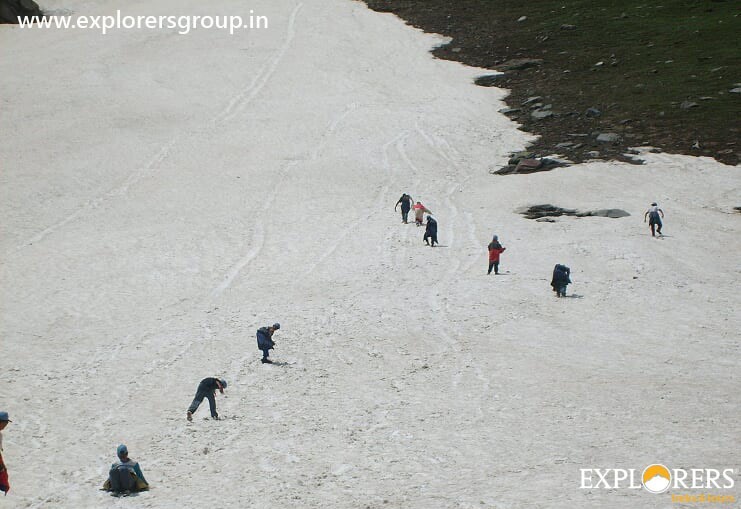 Get your legs ready to trek in the snow field above Kharimindiyari. Manali Snow Trek Specially designed for Students. Please Call for availability before you book Manali Snow Trek, to avoid 5% Transaction Charges. Last date of Enrollment for Manali Snow Trek: Till seats Left. 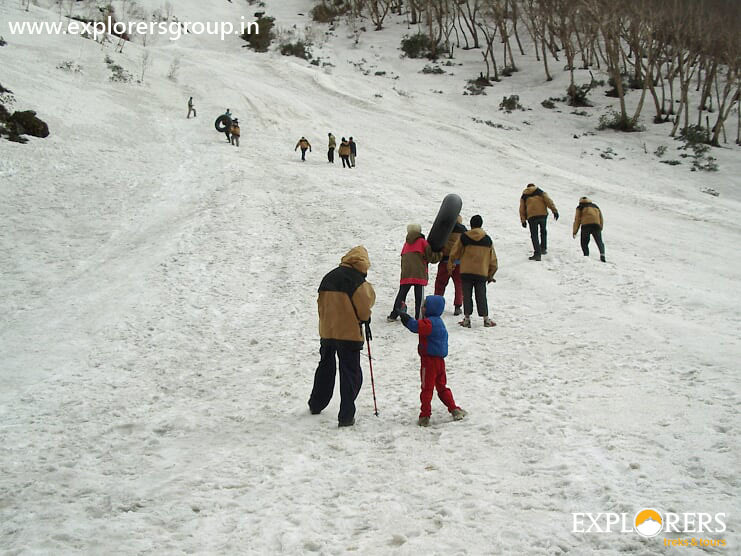 Departure Date & Time for Manali Snow Trek: Day 1 by Sharp 11.30 am from Pune AIRPORT. Arrival Date & Time of Manali Snow Trek: Day 8 around 08.30 pm at Pune AIRPORT. Reporting Time and Place for Manali Snow Trek: Day 1 by Sharp 09.30 am at Pune AIRPORT. 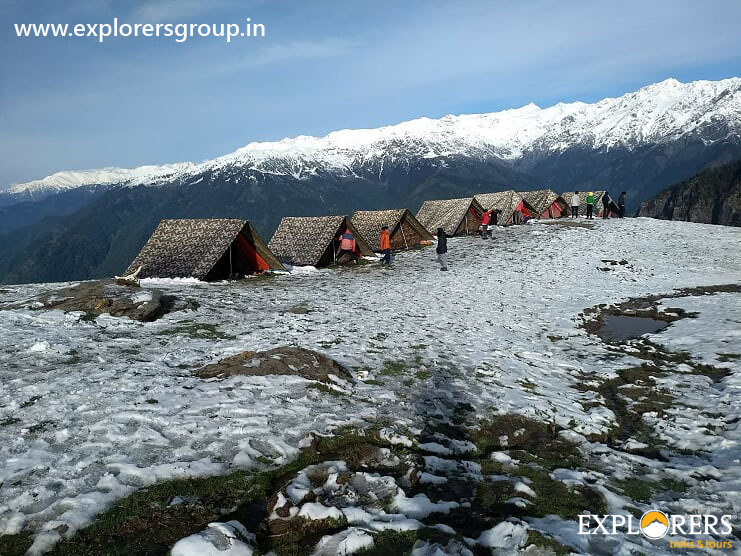 Type of Accommodation in Manali Snow Trek: Accommodation in tents at Manali (Shuru) & at higher campsite on multiple sharing. Route for Manali Snow Trek: Pune to Delhi by Flight. Delhi to Manali by Semi Sleeper AC Volvo. 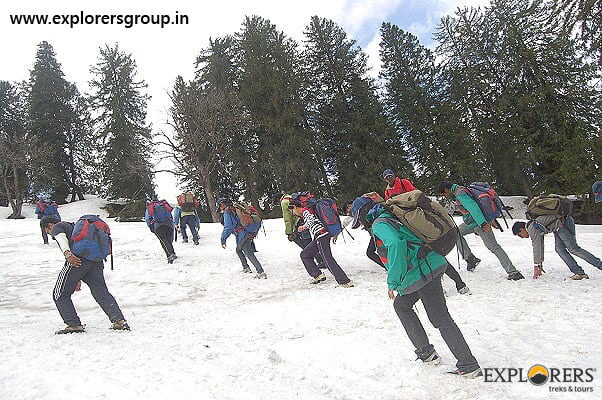 Age Group for Manali Snow Trek: Above 16 Years. All Participants have to report at PUNE AIRPORT by Sharp 9.30 am. Depart for Delhi from Pune Airport by decided time. Reach delhi airport after lunch depart for Manali by Semi Sleeper Volvo around 5 pm. Arrive at Manali Bus Stand around 9 am. 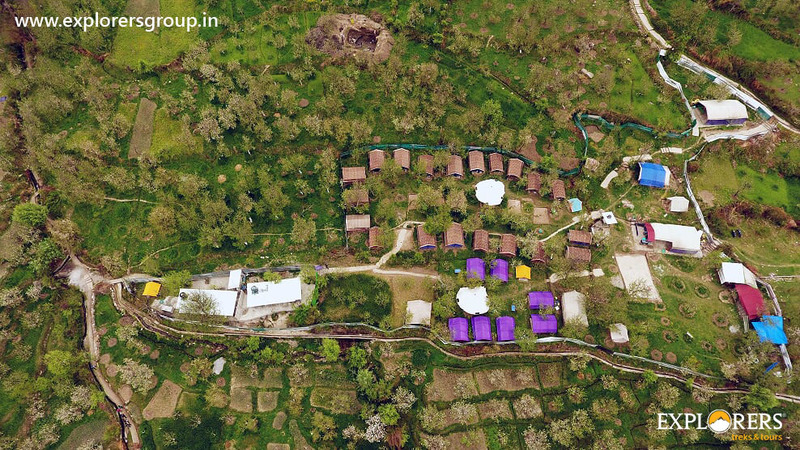 On arrival at Manali base camp tents will be allot. 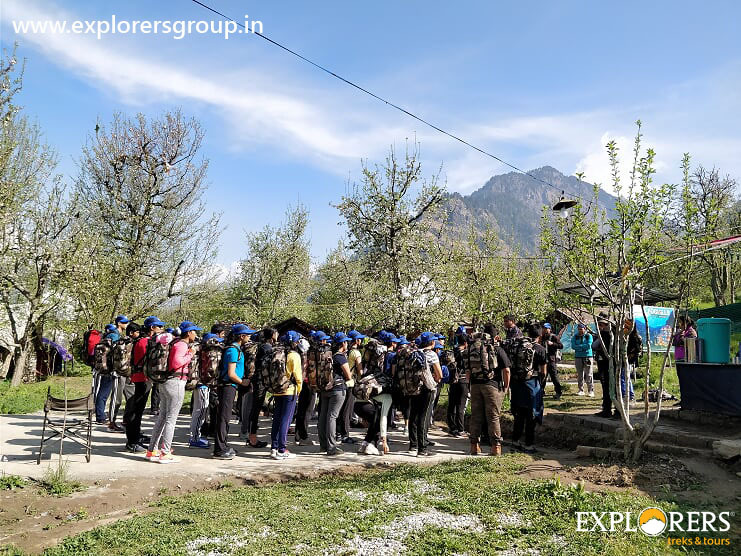 After Refreshment Introduction, Group Games & Group discussion & small Acclimatization Trek via Sharvari Devi Temple to Arjun Gufa. Trek is basically considering a lean & leisure walk to put you deep into an acclimatization process and make you fit enough to higher camps. 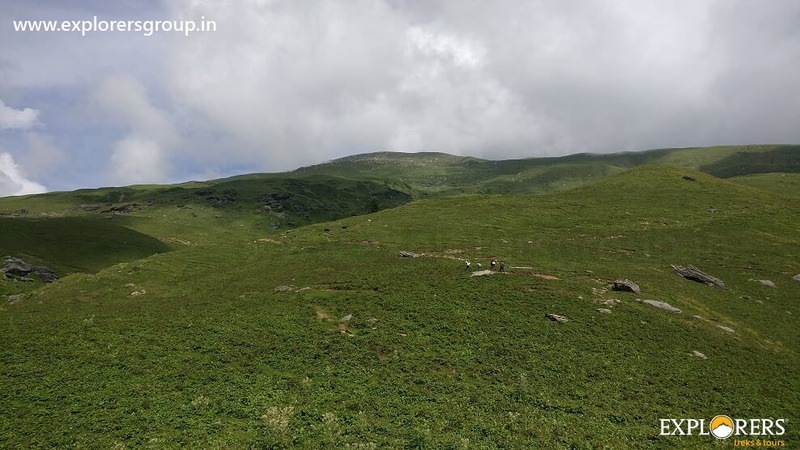 Shuru – Hamta Hills (8415 ft) 4 hours. Hamta Hills – Kharimindiyari/ Soroutoo (10296 ft) 4 hours. The trek starts with a moderate segment, through forest of silver fir, Bhujpattar, oak and chestnut. On the way to Setan is followed by a potato farm, which is one of the largest farms in Himachal. 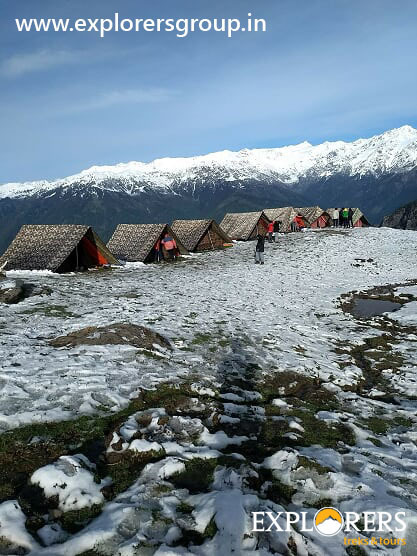 From the camp, there is an enchanting view of the Dhauladhar range and its lofty mountain peaks -Hanuman Tibba, Shikhar-bay, Maker-bay and Friendship peaks. 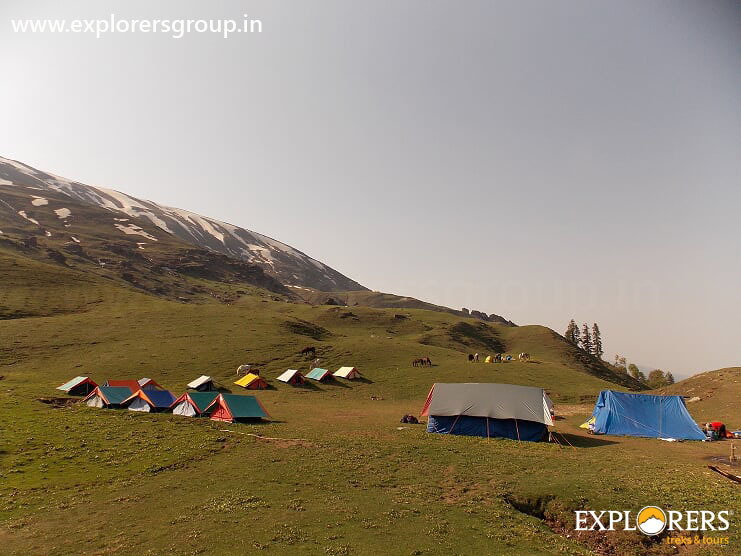 From the campsite you can also have a full view of Chanderkhani Pass and the Malana valley. 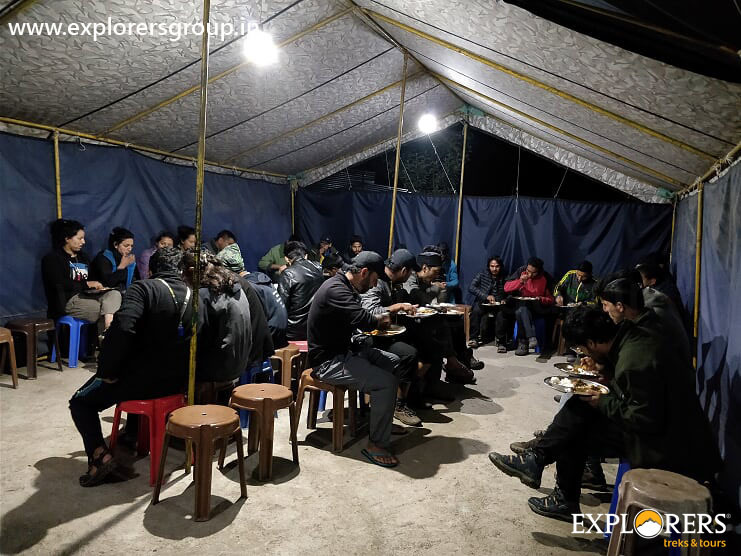 The campsite is in the open cloud and in the evening either move up to explore snowfield up or move to evening activities. Kharimindiyari (10296 ft) – Hamta Hills (8415 ft) 3 hours. The day begins at 6:00 am, will go through a warm up session. After having breakfast will move to exploration of snowfield trek up to the altitude of (3150M) to touch and feel snow and glissading on the slanted slopes. 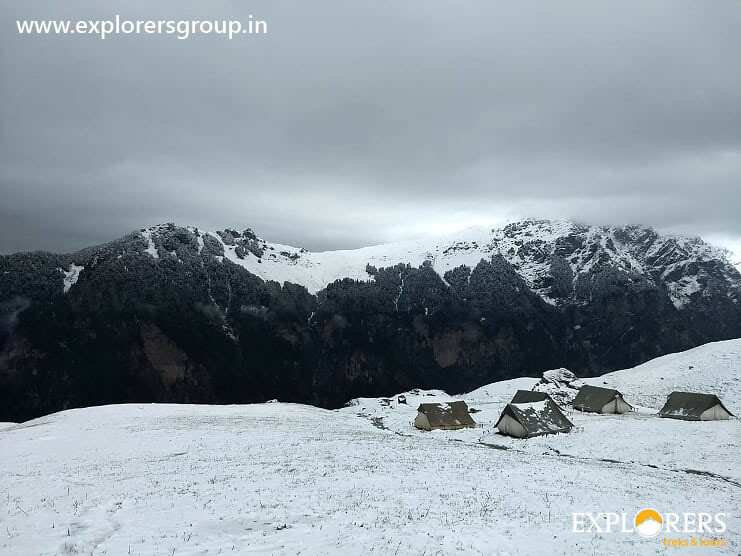 After completion of exploration trek of Kharimindiyari snowfield hills and back to campsite and after freshen up descend down to Hamta Hills. In evening we have some activities & group games. Hamta Hills – Base camp Shuru 2.5 Hours. Trek to Base camp Shuru from Hamta hills with two & half hours descending on the steepest section in a zigzag way till Jamdagini Rishi Temple through apple orchards. At temple rest for a while, then trail descends gently down till base camp. Evening at Leisure. After breakfast, freshen-up, keep your bags ready & will move towards Magical Mall road for shopping and roam around the market. In the evening by 5 pm depart to Delhi by Volvo. Arrival at Delhi around 8 am. Delhi Bus Point to Air port by Local Car. In Evening fly towards Pune with Happy Memories. Group Discount for Manali Snow Trek: 6 Pax. OR more – Rs. 500 per Head for Ex Delhi Option only. 122 Days before the date of Departure – Rs. 1000 per Head for Ex Delhi Option only. Food charges during Train & Volvo Journey. What to Bring for Manali Snow Trek? Shawl, Thermal Wear, Balaklava (Kantopi), Woolen Gloves. Water bottle – Min. 2 Ltr., Torch with extra Cells, Id Proof (compulsory), Nail cutter, Safety pin. * This is just a reminder list of what to Bring for Manali Snow Trek. You can bring other things as per the Need. We will provide the following items to the Participants in Manali Snow Trek – (For CAMP Period only on returnable basis). Following things are given Complementary by Explorers in Manali Snow Trek. Familiarize yourself to new shoes before bringing them to the Manali Snow Trek. Shoes must be large enough so that you can wriggle your toes with socks on. For Manali Snow Trek be sure to bring along your pullovers, jerkins / wind cheaters, monkey caps, gloves etc.